The first in-depth biography of the American actress and humanitarian campaigner who will marry Prince Harry in May 2018, written by the world's best-known royal biographer.When Meghan Markle and Prince Harry were set up by a mutual friend on a blind date in June 2016, little could they know that just sixteen months later the resulting whirlwind romance would lead to their engagement in November 2017 and marriage in May 2018.Since then, our fascination with the woman who has smashed the royal mould has rocketed. 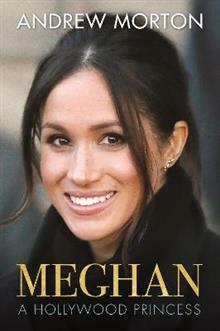 So different to those coy brides of recent history, Meghan is confident, charismatic and poised, her warm and affectionate engagement interview a stark contrast to the stilted and cold exchange between Prince Charles and Lady Diana Spencer.In this first-ever biography of the duchess-to-be, acclaimed royal biographer Andrew Morton goes back to Meghan's roots, interviewing those closest to her to uncover the story of her childhood: growing up in The Valley in LA, studying at an all-girls Catholic school and her breakout into acting. We also delve into her previous marriage and divorce in 2013, her struggles in Hollywood, as her mixed heritage was time and again used against her, and her work as a humanitarian ambassador - so redolent of Princess Diana's passions. Finishing with an account of her romance with Prince Harry, Morton reflects on the impact that Meghan has already made on the rigid traditions of the House of Windsor - not even Kate Middleton was invited to Christmas with the Queen before she had married her prince - and what the future might hold. Andrew Morton is a leading authority on modern celebrity and royalty, and author of the internationally bestselling biography Diana: Her True Story. Revealing the secret world of the Princess of Wales, the book spent fifty-eight weeks in the bestseller lists, was translated into 35 languages, and inspired films, documentaries and commentaries about the royal family. Since, Morton has gone on to write No. 1 Sunday Times and New York Times bestsellers on Monica Lewinsky, Madonna, David and Victoria Beckham, Tom Cruise and Angelina Jolie, as well as a ground-breaking new biography of Wallis Simpson, Wallis in Love: The Untold True Passion of the Duchess of Windsor. The winner of numerous awards, he divides his time between London and Los Angeles.